Let's Talk: Is a Design System Right for Your Organization? 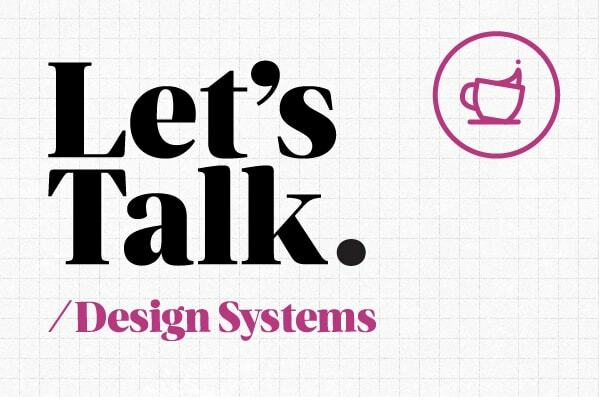 In our first issue of “Let’s Talk,” we’re tackling design systems. What is a design system and when should you build one? What’s the difference between a design system and a pattern library or style guide? What makes a design system successful? What are the challenges of not just creating a design system, but also making sure it’s adopted and maintained? We’ll be tackling a new topic a few times a year and are always interested in your feedback. Reach out and let us know your thoughts. What do you want to see us talk about next? Looking for a primer on design systems? This is the place to start. In 2018, we conducted a survey about how design systems are changing the way our industry works. We analyzed responses from 400 individuals at organizations of all sizes, in industries including retail, healthcare, education, finance, government, and entertainment. What we found is that a design system is not a one-time project. It is an investment in your future and represents a shift in the way your organization works. Read on to find out how effective communication, collaboration, and leadership can make a difference in how a design system is created, staffed, and used. One of the earliest articles we published about design systems, this post by Nathan uses the term “style guide” synonymously with “pattern library” and “design system.” There are differences among them, but the similarities are worth paying attention to. In this article, Nathan explains that any successful design system, style guide, or pattern library begins with thinking about it as a user-centered product, where your users are the developers, designers, content authors, and marketing teams who will be using the design system. Start by identifying and solving for user pain points, and you’re setting up your design system to succeed. Kasey begins this article with a really interesting observation that her job as a web developer has transitioned over the years from building websites to building the design systems that build websites. This shift has created some interesting challenges and opportunities, which Kasey tells you how to navigate. Start with planning, she advises (it’s easier than refactoring later), then figure out if you want to use a prebuilt system or build a custom one. Other tips include budgeting for maintenance, documenting the process for adding new patterns, and educating stakeholders to encourage adoption. There’s no denying the powerhouse potential of a well thought-out design system. Design systems can provide live, interactive examples of often-used components, assist in the rapid build of new pages and applications, and ensure brand consistency. But a major risk with any design system is that no one will use it. In this article, Catherine focuses on how to overcome disengagement and maintain subscriber loyalty. Pay attention to user needs, she writes, plus regularly update the system and invest in marketing it as a product. Design systems are awesome! You get it. But there are times when they’re not the right path forward. In this article, Bryan explains how a design system may not be what you really need, especially if your team is small and isn’t doing active product development, or if your business has what he calls “limited runway.” This article is a useful reminder that, as our VP Rob Harr says, “The biggest risk for software projects is building the wrong thing.” Read on for a helpful reminder that a design system is not a one-size-fits-all solution. Want to learn about the design system work we’ve done with the Gap brands? Watch our projects director Drew co-present at ConvergeSE in 2017 to learn how a design system changed the way Gap works. The video is about halfway down the page and is worth the 40 minutes you’ll spend watching it. You’ll hear suggestions on how to turn a design system idea into a reality, including tips for consensus-building, adoption, and engagement.